They are saying the same kind of scenario about the Colorado river in Wharton. Ah Hell no, not again........I live 1 mile from the Richmond Brazos river. It missed me by like 200 ft last time at 54.7 ft.. Thanks for the heads up. I didn't realize they already were forecasting again. A 40' rise... that is crazy. I hope it's not as bad as predicted. We had a bad spring flood and they make such a mess. I just spent a bunch of $ on a house and barn pad out at the Bar X Ranch between Angleton and West Columbia. We are less than a mile off the Brazos and it flooded bad last year. On a positive note; it might give me an idea of how the water can get on the pad. I'm not through with it anyway, but I plan to build it up to where it cant flood the house. It's a good thing we haven't had much rain in the last month or more, if the river was up and that surge hit then we would probably see last year's record broken. I'm just concerned about how much they underestimated the initial crest last year when we reached record levels. I know you dont want to hear this but I just got an email and it says they expect the crest to be 55 ft on Thursday. Im sure it will change some up and down over the next several days but that is the latest info. Where is that email from? We were stranded in our neighborhood last time and I don't want that to happen with a wife 7 months pregnant. Please be aware that as of 7:00 PM, Hurricane Harvey has been upgraded to a category 4 storm. It is still projected to hit near Corpus Christi late tonight, or early tomorrow. During local and national conference calls this afternoon, we have been given updated information regarding the Brazos River. I am passing this information along to the community in an effort to keep you informed. The more information you get, the less rumor and innuendo will be flying around. Please understand this storm is constantly changing, and this information will be updated regularly. Rainfall Amounts – As of this evening's National Weather conference call, rainfall estimates for Fort Bend County are between 10"-20" thru Monday. Projections are for an additional 5"-10" from Tuesday thru Thursday. Coastal areas could see an additional 5"-10" above this. This information will be updated as soon as we get any changes or updates. RIVER/ LEVEE – After several conference calls/ emails with local and national authorities, the Brazos River is now expected to reach 51' at Richmond on Monday evening (3' below last year's peak). With the additional rainfall expected upstream between Tuesday and Thursday, the projected crest of the Brazos is expected on Thursday at or slightly above last year's record level (54.6'). I am in communication with our levee management groups to roll out the necessary precautions. We will move pumps into the West side of New Territory (High Meadows, Autumn Ridge) on Sunday, to pump out excess water as needed. Tiger dams will be put out along the Bullhead Slough shortly thereafter. Current projections place the peak water level at or near the base of the levee, around the same levels seen last year. This will be a quick river rise and levels should start falling shortly after the river peaks. This information is constantly being updated, and could change later into next week depending on what the storm does. We will continue to monitor the situation and post updates as necessary. All resources necessary will be available and put in place as needed. NTRCA FLOODING – At this time, we still predict local street flooding throughout the duration of this event. 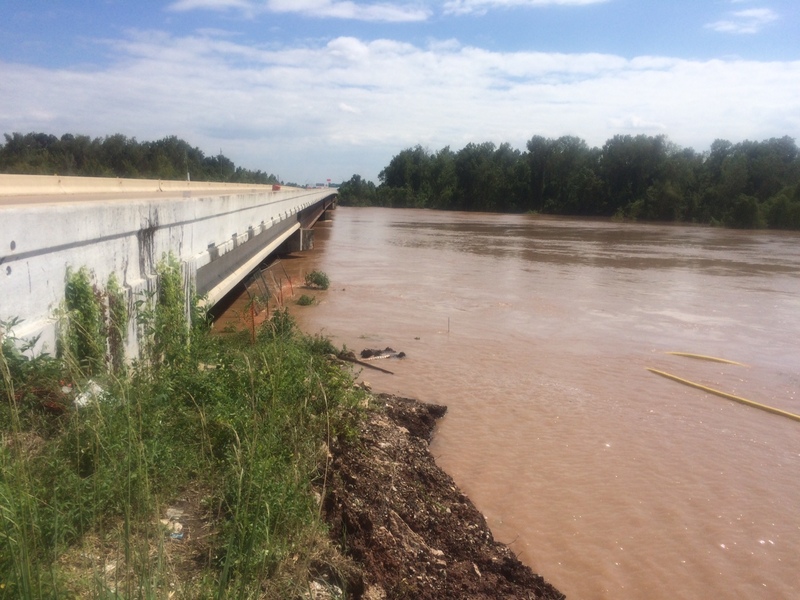 Levee Management Services will monitor the internal channels and ditches, and pump them out into the Brazos, as needed, throughout the weekend and into next week. This will allow the natural flow of water into the creeks and ditches as it continues to fall. It is important that items like trash cans, yard furniture, loose items around your yard and old newspapers be cleaned up and not allowed to flow into the drainage system. Again, please move all vehicles out of the street and into the higher area of your driveways. If you have extra driveway space, please offer it to your neighbors who don't. UTILITY OUTAGES – Please be aware of downed power lines. Do not attempt to cross them. If you lose power or natural gas, you can report outages to CenterPoint Power – 713-207-2222 & Gas – 713-659-2111. Water issues can be reported to your water provider. SI Environmental - 832-490-1600 & Municipal Operations – 281-347-8686. I will continue to attend future conference calls and send out updates as they become available. Let me know if there are any questions or concerns. Please pass this on to any of your friends or neighbors that might not receive it. If you are receiving this email from a friend, please take the time to go to https://secure.associationvoice.com/...t/SignUp/12798 and sign up to ensure you receive future emails and information when it is released. Please let me know if you hear anything else. What street? I kill all my deer off of Frontier Trail. Plan to eventually build. Yeah they bumped it up to 55' now. Link for anyone interested in following it. City of Rosenberg is estimating 58. I guess they are basing this on projected rainfall amounts and not on what has fallen so far. 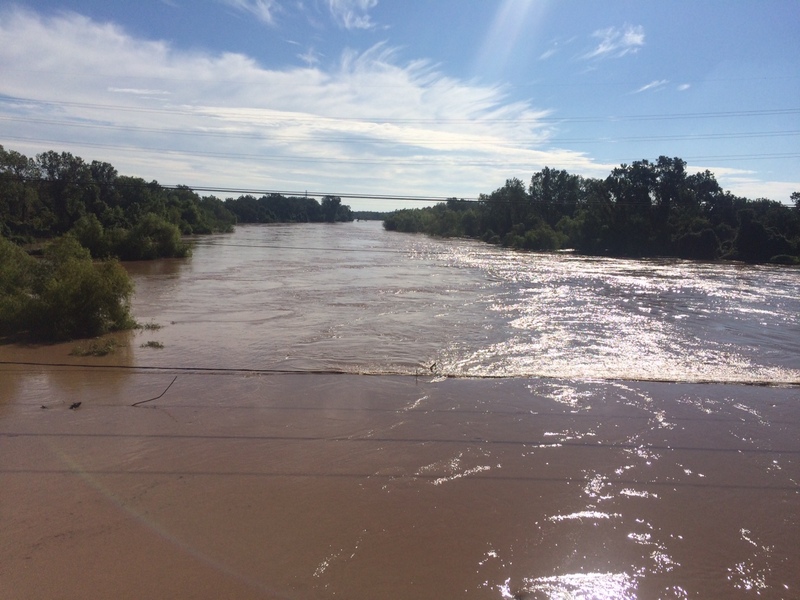 Right now the Brazos is very low at Hwy 1093. Hope there projections are off. Gentlemen, I live in Bryan which is upstream of you there in Richmond, but I used to live in Pecan Grove. We are getting the kind of rain that you do not want to hear about. Whatever they're telling you expect the worst. I was doubting their 55' height at the Richmond gage earlier, but not anymore. It's going to be real bad for a lot of folks. Also, The Colorado is supposed to crest at 50 in Wharton...that is not good for any folks around there. 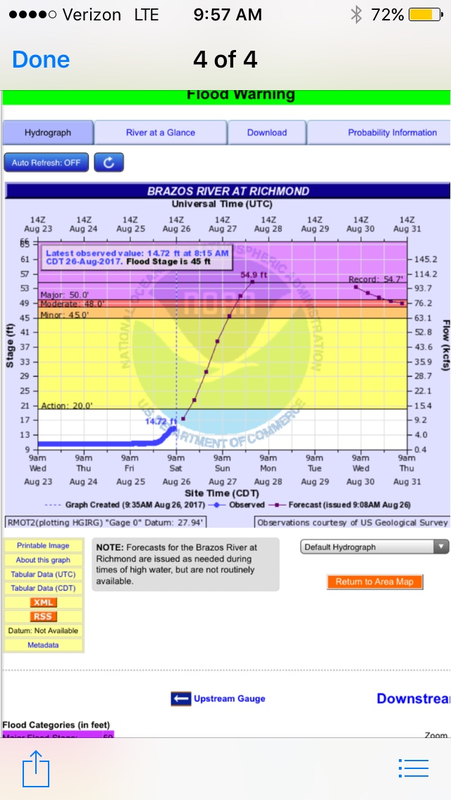 The latest update I received a few minutes ago is now calling for the Brazos to reach at least 56 ft at the Richmond bridge which is over 1ft higher than the previous record set last May. This is just terrible news for so many. Still raining pretty good in Bryan, and it has been all day. Wife just told me that the Ft Bend Co facebook page is expecting 59 feet now. At 55 ft the levee should protect Pecan Grove. At 59, no one knows as it's never been that high. The Facebook post says that the flood maps are being reviewed and they will update expected impact areas as soon as possible. In short, this ain't looking good at all. Lori Bradshaw Hendricks Osborne - I am watching you watch this thread! Country people know the weather. Just watch them announce the Brazos related mandatory and voluntary evacuations. They are still expecting 59 feet at the Richmond bridge. They said that they expect the Pecan Grove levee to hold but all access in and out will be blocked off for several days. Due to all access being cut off they issued a voluntary evacuation. Not sure what we will do ourselves. Talking it out now. If we go where would be go? All family is in Victoria and Cuero so no good heading that way. We've got plenty of food and water (and scotch) so we could hold out for several days if needed. Hmmm.. a lot to think about. If you need a place to stay you are welcome at my place if we can get you here safely. This was just posted to the Pecan Grove MUD web site. Fort Bend County Judge Bob Hebert has just issued an order for voluntary evacuations for several Fort Bend County subdivisions, including Pecan Grove MUD. This order is based on a potential gauge reading at 59.0’ at the City of Richmond Brazos River bridge. We calculate at this unprecedented level, Pecan Grove MUD has potential levee breach issues at 5 locations. We want to provide this update not to frighten residents, but to do our best to inform you as to these unprecedented emergency situations. Please consider your personal circumstances and family situation as you decide whether to voluntarily evacuate your home. We strongly encourage anyone with medical conditions needing potential attention to leave while the roads are able to be passable. If the Brazos River levels reach the levels projected, you will not be able to exit onto FM 359 and we cannot predict availability of other roads. Below is a summary of the locations and what we are doing to mitigate those areas. Our crews are working non stop to help mitigate the situation. – FM 359 North Crossing (By the Tennis Courts). If left unmitigated, at a Brazos River level of 59′, projections are that water would enter the Pecan Lakes Subdivision (325 homes) and the commercial along FM 359. Pecan Grove MUD plans to deploy around 200’ of WIPPs (a special device to act as a temporary dam) per the MUD’s emergency action plan (EAP). water would enter the Pecan Lakes Subdivision (325 homes) and the commercial along FM 359. Pecan Grove MUD plans to deploy around 200’ of WIPPs (a special device to act as a temporary dam) per the MUD’s EAP. – Access Road to the MUD Sewage Treatment Plant (on FM 359 south of the commercial properties before Plantation Place). If left unmitigated, water would enter the Plant Site and the Pecan Grove Subdivision. Pecan Grove Plans to deploy around 40’ of WIPPs per our EAP. – Mason Road from the Golf Cart Barn to Oyster Creek. At a Brazos River level of 59.0’, if left unmitigated, water would enter the northern portions of Pecan Grove. We need around 40′ of WIPPs to be deployed to help protect this area. – Southern Place Drive (Plantation Place Subdivision). 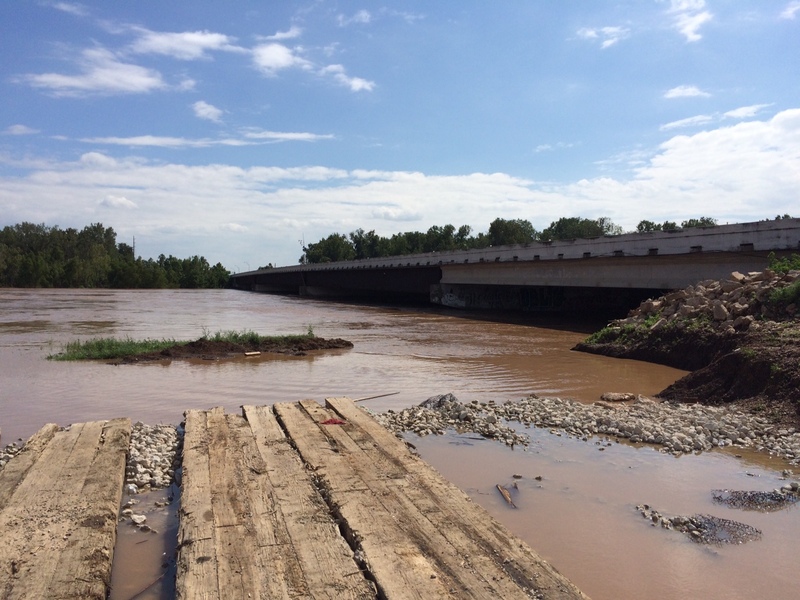 Residents may lose access out onto FM 359 at a Brazos River level of 56 to 56.5′. We plan to try to separately inform these residents. If left unmitigated, water would enter the Pecan Grove subdivision. We plan to mitigate this area by deploying about 100′ of WIPPs per our EAP. It is possible we will need manpower to assist with sandbags. Please do not call the MUD office. Please watch this site. We will put out calls for volunteers should the need for additional personnel arise. Please take care of yourself and your family. These are scary times. Place to stay downtown if you need it. Thanks for the offers guys, really appreciate it. Looking like we might be locked in already due to not being able to get north or west from here. 99 around Clay and around 529 looks to be under water. 290 in Prairie View looks questionable on the Drive Texas web site but Google Maps is showing closures. We bugged out this afternoon and made it to my folks place. Took some doing to find a clear path but we are safe. Worried about the house and what we might go home to but as others have said, it's just stuff. Glad y'all made it out...I have a REALLY bad feeling about the Brazos if it hits 59 or more! 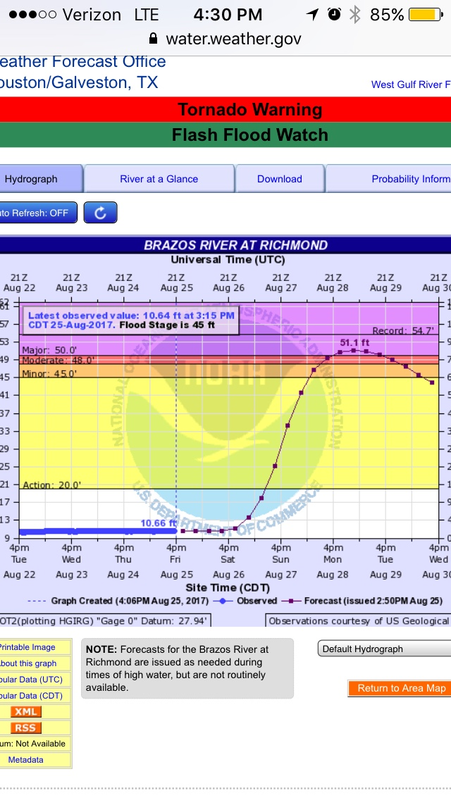 The projections for the Brazos might be changing in our favor slightly, very slightly but still a sliver of good news. They are still calling for a crest of 59' but now it looks like that will come mid morning Thursday, not Tuesday evening. The river should start going down mid day Friday and be back in the 54' range late night Saturday or Sunday morning. That is still major flooding. Anyone know info on the levee breach and what might be effected? I just checked again (a little slow at work) and they just lowered the projected crest to 57'. This is major good news. Still higher than ever seen before but 2 feet less is a good thing. Is that because of the breach letting the water spread out? Breach? What breach? I must have missed something. I think the lowering of the crest is due to the storm moving further east and not putting quite as much water in the upstream watershed. The levee in Brazoria county breached. Wow... I completely missed that. It might have some impact on the crest in Richmond, not sure. I sure hope we didn't catch a break at someone else expense. Brazoria is well below Richmond. Even at 57 feet it's going to be bad. Richard, what are y'all seeing, or did y'all bug out too? Thanks.. i thought it was downstream of Richmond but didn't check on google maps so didn't want to say. Looking at the upstream gauge in San Felipe it's already dropping fast up there and the downstream gauge in Rosharon has already peaked and appears to be dropping. Not sure if our area in Richmond/Rosenberg is a bottleneck causing it to show a coming increase or if they are just being conservative. We've been chasing the crest all week, it's always 36 hours out and never comes. The flooding at my house is completely different this year compared to the flood last year, lots of variables that impact this I understand. This level last year it was a few feet from coming in my house and this year it's still not out of the drainage ditch at the back of my property which is almost 100 yards away. I'm thankful it's different, just really odd how vastly different it is for us. Well, ****. I spoke too soon. Water has come up about 3' vertical rise, or more, in 18 hours. Going to be close if it gets in the house. I think our bigger problem are the idiots that are driving through the high water in the road, which is causing wakes and could force water in the house before it even floods. I think our bigger problem are the idiots that are driving through the high water in the road, which is causing wakes and could force water in the house before it even floods. I wondered about this in all the pictures I saw. That would definitely be a problem.